The city of St David’s is located on the St David’s Peninsula in what is the Pembrokeshire Coast National Park in South Wales. This is a place that has always received its fair share of visitors, from the medieval pilgrims that journeyed to the town to visit St David’s shrine, to the visitors of today who come to enjoy the incredible hospitality and beautiful scenery that the area has to offer. The city takes its name from the patron saint of Wales who, according to local legend was born on the nearby cliff tops. 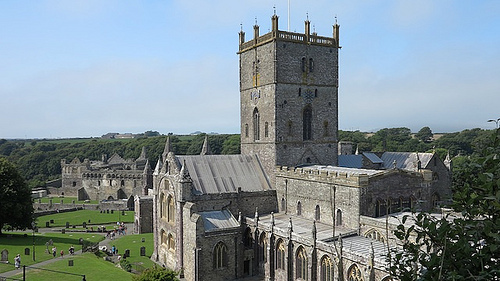 It was St David that founded the monastery here, on the site where the stunning cathedral now stands. The cathedral has been welcoming pilgrims for centuries and you too must make a point of going inside this incredible building to view the wonderful architecture and the amazing 16th century wooden ceiling constructed from Irish Oak. On the site where the cathedral stands you will also find the ruins of what was once the palace of the medieval bishops. Despite the centre of town being fairly small and compact you will find much more here that you probably expected, as aside from the usual town centre attractions of shops and bars you will also find the Marine Life Centre and the St David’s Visitor Centre operated by the National Trust. The village square is still very much at the heart of the community and is a regular meeting place for events and activities. The central gardens within the town make the ideal place to sit and relax and just let the world pass by for a while whilst you enjoy the tranquillity of the gardens. If you arrive in St David’s during the months of May and June the cathedral will be filled with music as it hosts the classical music festival and if you arrive here during late summer you will find that you have arrived in time to enjoy the annual festival which celebrates all that is local, from food and cookery demonstrations to arts and crafts. Although St David’s gives the impression of being a peaceful place to be it also attracts those looking to take part in some adrenalin fuelled activities. There are a number of local businesses that offer activities like surfing and windsurfing, sea kayaking and climbing as well as an activity called coasteering, which involves jumping from the cliffs into the ocean. If all of this sounds far too exciting then try a boat trip over to the RSPB reserve on Ramsey Island, there are also a number of wildlife adventure tours and activities on offer as well as whale and dolphin watching. This is one part of Wales that is rich in local history and around the area there are a number of Neolithic tombs as well as Bronze Age standing stones, tiny little chapels and shrines as well as healing wells. Just outside of St David’s there is also an Iron Age fort that has been excavated at Castell Henllys, with huts having been rebuilt to give some idea of what living conditions were like at the time. This really is a place where you can not only traverse the centuries with the history on offer but you can cross millennia too. There are a number of coastal walks that pass within a mile of St David’s that will take you through some beautiful bays, offering some spectacular scenery. The nearest beach is Caerfi Bay, this is a beautiful sandy beach which offers clean sands and excellent water quality, nestled as it is between vast cliffs inside a rocky cove, it is located just a mile outside of St David’s and is very easy to get to. This lovely beach and cove is popular with swimmers as well as canoeists and sea anglers and the Pembrokeshire coastal path that runs along the cliff tops and around the bay offers some incredible views out over the bay and out to sea. Wherever you go in St David’s be sure to take your camera with you as you will certainly snap some beautiful shots in this stunning part of South Wales.